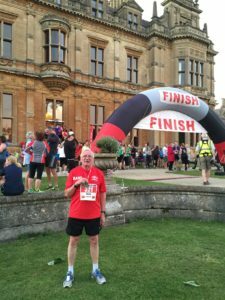 It was great to be part of the inaugural Westonbirt House 10k. I have entered the ballot for the London marathon and it is my intention to run a marathon in my 80th year. My first sport was rugby football which I played at school and club level until an injury in my early 30s prevented me from continuing to play. I became involved in U/19(Colts) rugby at County and England level until I moved to Wiltshire from Surrey in 2000. After a couple of years I joined my local gym PD Fitness Malmesbury. Once a year they persuaded members to take part in the Chippenham 5K river run. I took part on a couple occasions but was required to have a hip replacement in 2006. Following the operation I continue to attend the gym. I 2009 I was persuaded once again to do the river run and also the following year. I have always been competitive and was very disappointed with my time in 2010. I look for ways to improve my time and discovered Parkrun at Lydiard Park Swindon and begun running on most Saturday mornings. After about 3 months I got to know one or two other runners and it was suggested I should join one of the local running clubs Slinn Allstars in Swindon. That was the start of my racing and I had got the bug at the age of 75. Since then I have completed both the Great North and Great South runs, 6 half marathons including Bath Reading Bournemouth and Rhyl some 40 10ks including Madrid, Swindon and Longleat and hopefully later this year Majorca. I have also run the Malmesbury 10k which is organised by DB Max. I am fortunate that my Gym and Club have given me every encouragement and support since I started running at what some people think is late age.